New River Trail State Park is one of Virginia's most unique parks, following a relatively recent trend in public parks - the linear park or greenway. Still under development, New River Trail is a 57 mile long state park that follows an abandoned railroad right-of-way. The park meanders through Grayson, Carroll, Wythe and Pulaski Counties in Southwest Virginia and parallels the scenic and historic New River for 39 miles. This park also serves as a link to numerous other outdoor recreational areas, including a town park in Fries, Mt. Rogers National Recreational Area, two Dept. of Game and Inland Fisheries boat launches and Shot Tower State Historical Park. 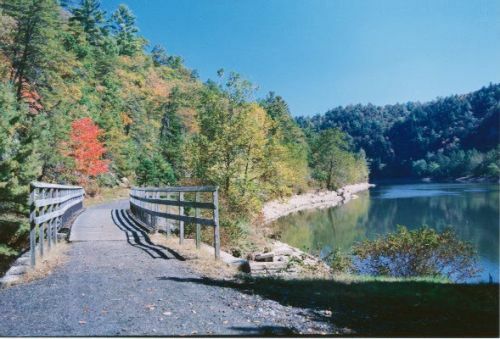 New River Trail is also just minutes from Clayton Lake State Park and Grayson Heights State Park.